Can college sports ban social media? Any baseball fan is familiar with MLB's frequent reminders not to rebroadcast a game without "the express written consent of Major League Baseball." But did you ever consider that your Facebook, Twitter or blog posts could be targeted by overzealous media regulations? 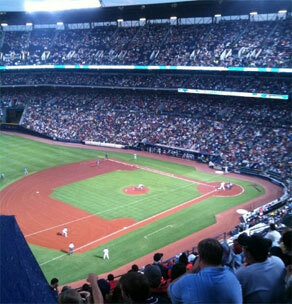 Can the SEC prohibit fans from sharing pictures similar to this iPhone shot of a Braves game I posted to my Facebook profile? Should they even bother trying? According to current policy, Southeastern Conference (SEC) fans cannot "produce or disseminate (or aid in producing or disseminating) any material or information about the event, including, but not limited to, any account, description, picture, video, audio, reproduction or other information." Adam Ostrow, of Mashable.com, translates that to mean "no Twitter, Facebook, YouTube, TwitPic, or any other service that could in any way compete with authorized media coverage of the event." The SEC media-credential policy also states that violations may result in "ejection from the Event and prosecution for criminal trespass." Conference spokesman Charles Bloom told the Charlotte Observer there are plans to loosen the restrictions, but the current policy forbids tweeting from the stands. While speaking with CNN, Attorney Evan Brown questioned the legality of the SEC policy. Brown equates a ban on social media in state-sponsored schools to a violation of the First Amendment and a form of prior restraint. Media-coverage rights to sporting events have always been expensive and, consequently, heavily policed (this year the U.S. Open banned all cameras and phones) but can social media possibly be restrained? Could social media ever compete with authorized media coverage in a way that would threaten profits and rationalize SEC's media policy? Bloggers Adam Ostrow, Evan Brown and Steve Raquel discussed the SEC policy today on CNN.com Live (Watch Video). This afternoon the SEC released a revised version of its media policy (pdf). The revision provides exemptions for noncommercial updates and personal messages. No Bearer may produce or disseminate in any form a “real-time” description or transmission of the Event (i) for commercial or business use, or (ii) in any manner that constitutes, or is intended to provide or is promoted or marketed as, a substitute for radio, television or video coverage of such Event. Personal messages and updates of scores or other brief descriptions of the competition throughout the Event are acceptable. As a direct challenge to Google Apps, Microsoft is rolling out lightweight, FREE, Web-browser versions of Word, PowerPoint, Excel and OneNote. All based in the cloud, the web-based versions of these products have less features than their desktop cousins but still give users basic tools to edit and change documents. According to Microsoft, the focus of this update was on three things: to make work flows more efficient; to effectively use Web applications to make your work available anywhere; and to make collaboration with others much easier. Mashable has a good post on location-based phone services. A new survey says the number of people using location-based services will double to 5.7 million this year. The rise in GPS-enabled smartphones - those that know where you are and act like mini-computers - accounts for much of the increase. Apps are responding in kind. Zhiing is a new mobile app for sending friends your location as quickly as possible, Yowza sends you coupons based on what stores are nearby, and Google Latitude helps map out where you and all of your friends are. This type of information helps get the most relevant information to you as quickly as possible. Weather forecasts, nearby friends, and local train schedules are automatic. The Obama Administration in May proposed slashing funding for Enhancing Education Through Technology (EETT), one of the main government sources of technology for public schools, to $100 million in 2010, a 63% decline from this year's $269 million.